One of my favorite things in the world is a good Asian peanut sauce. If you add noodles, it’s even better! I’ve been trying to achieve the perfect peanut noodles with just the right balance of heat, spice and sweetness. At long last, I think I have found it. Pull out your big noodle bowls because you’re going to want a big helping of this! It also comes together really quickly so make sure you have all your ingredients ready to roll before you turn on the heat. Heat the sesame oil in a wok or large skillet over medium heat and sauté the garlic for a few minutes. Stir in the peanut butter, chili paste, vinegar, curry powder, and honey. Heat through, stirring constantly to maintain the consistency of the sauce. Add the coconut milk and stir to combine, then add the chicken and peppers and heat through, about five minutes. 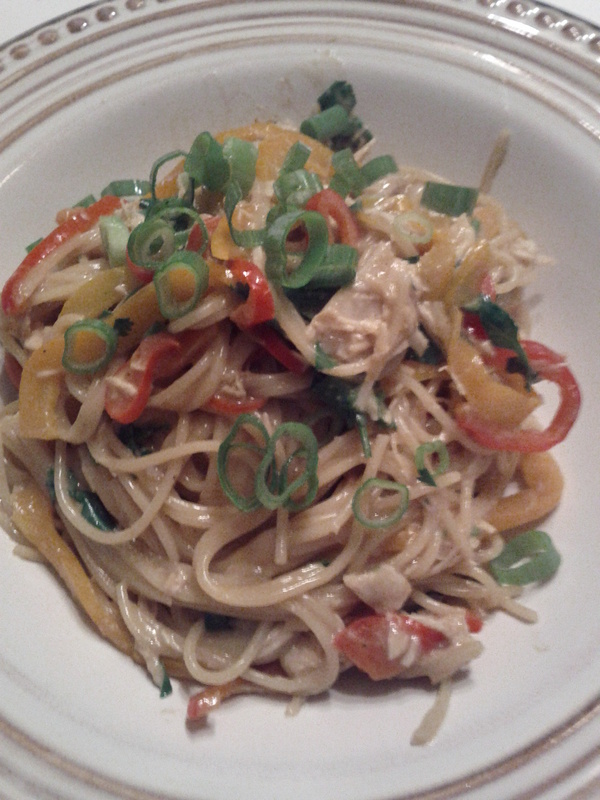 Toss the noodles and sauce, top with the cilantro and green onions and enjoy!